Since the inception of the award in 1972, Maybank has sponsored more than 1,000 scholars as well as provided them with employment opportunities. The scholarship awards incorporate the Bank’s CSR philosophy of ‘Growing with Responsibility’, assisting those who excel to complete their tertiary studies and pursue a career with the nation’s largest financial services group. Achieve your aspirations with this Maybank Scholarship Award 2015. Realise your full potential and be part of Asia's leading financial services group. Full education financial assistance from Pre-University/Foundation studies up to degree level at local and overseas institution (tuition fees, laptop, accommodation, and living allowance). Career Preparatory Suite (internships, business assignment, presentation impact and effective communication). Bond period of 3 to 5 years (varies according to schemes). Applicant must not be a recipient of any other scholarship or award from other organisation(s) or foundation. Accounting, Finance, Management, Marketing, IT, Economics, Banking, Actuarial, Mathematics, Human Resource, Psychology, Business, Law, Statistics, Investment, Risk Management, Engineering. Full education financial assistance from Pre-University/Foundation/Undergraduate studies at local institution (tuition fees, laptop, accommodation, and living allowance). 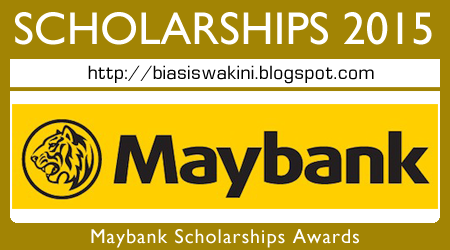 How to apply this Maybank Scholarships 2015 ? Interested to apply vacancies in Maybank? Please visit JomJobs.com for latest Maybank jobs 2015. 0 Komentar untuk "Maybank Scholarship 2015 | Tawaran Biasiswa Maybank 2015"